Hi everyone and welcome to SimCom. 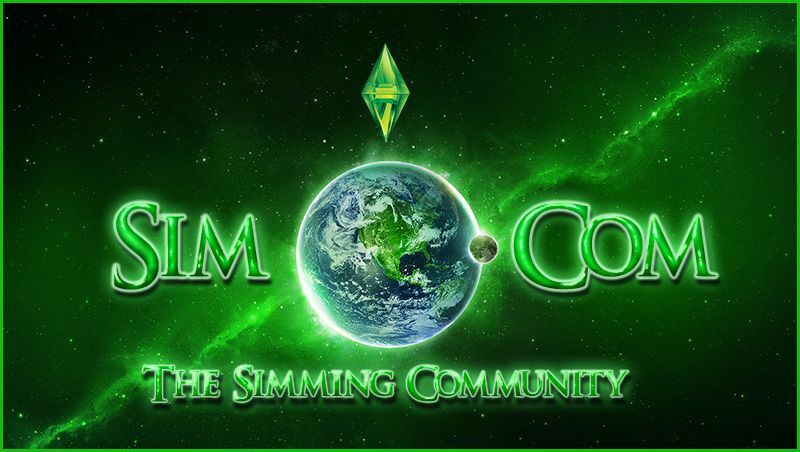 SimCom is short for The Simming Community, together with a few of my favourite people from the Sims forums we hope to entertain you highlighting a variety of sims activities and features. We hope this thread will become highly interactive for you in any area you choose, each section will have an interactive part to it where you can get involved, nominate people, be creative, submit creations and also chat. Also you will find The Gazette Interviews have moved over here and now has a fresh new look and renamed The Simformer to be a part of this wonderful thread. @lisa17ann, @pebblycat, @pammiechick, @mommataurus2 oh and me @Cbear13. We are a crazy bunch of ladies that have a huge addiction to this game and would like to share with you our areas of passion. You can find a table of contents below with direct links to each area of SimCom. Each of us will be updating our own sections and we will inform you by a new post when we have done so. There is no time frame on this so that we can enjoy this experience as much as you and do it in our own free time. So keep your eyes peeled. We do ask that everyone be respectful to everyone while using this thread, anyone being rude or disrespectful will never be showcased or advertised in anyway. This thread is purely for the enjoyment for the community if you have any issues please message myself or one of the lovely ladies listed above who run this thread with me. We hope you all enjoy this as much as we are and we cant wait to have some fun with you. 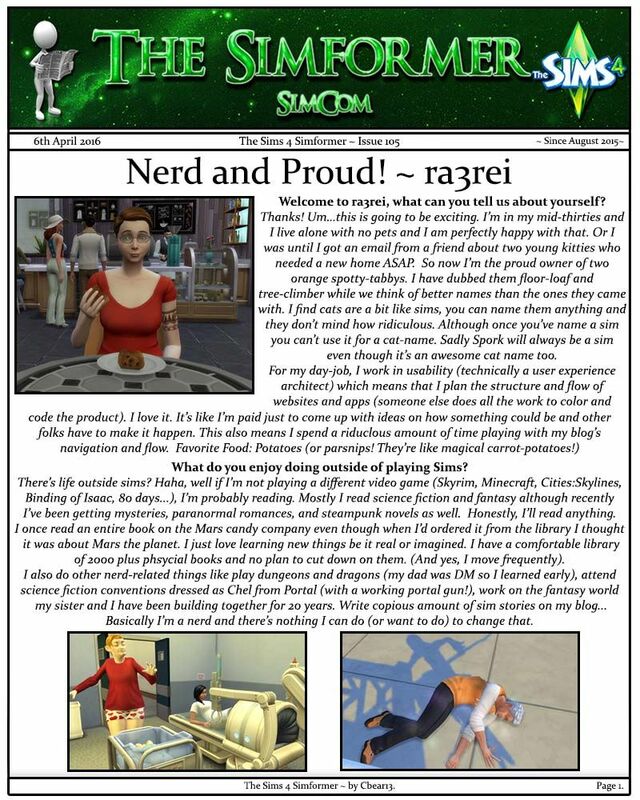 Welcome to SimCom News and Advertising! 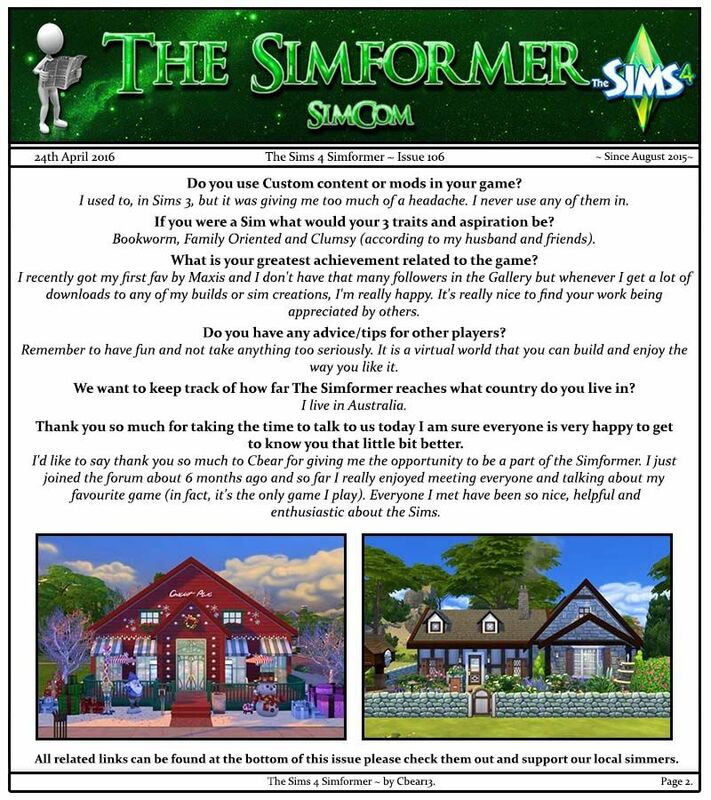 Here we will bring you some news from around the simming community and forums and also advertise some community threads like competitions and other threads that involve the community to be interactive. If you would like your community thread advertised please post of message me (Cbear13) and I will endeavour to have it mentioned here. I don't know about you guys but the stuff in this pack looks pretty awesome, I especially like the world globe.... oh and BUTLERS are back!!! Wow how fun do both these packs look? 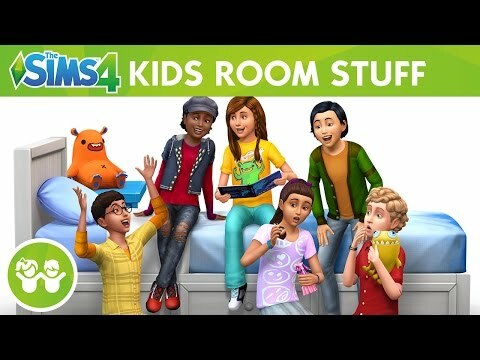 I have to say these latest packs have brought so much cute, colorful and fun stuff to decorate and play with. I cant wait to create and build. There are plenty of competitions around the forums for all aspects of the sims, here are a few of the building competitions hosted by myself and other wonderful simmers, even if your not one to enter the threads are a lot of fun and the entries are definitely worth checking out. 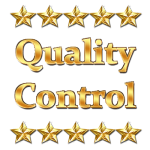 The Quality Control franchise has 3 separate competitions, a weekly room competition, a two weekly build competition and a monthly build competition. The two build challenges have their own sim creation challenges that you can enter on their own. Links to all winning builds and entries can be found on the competition threads. You have to check out the BUILD-N-SHARE CHALLENGES, this amazing competition has been around for a long time and cater for all types of builders. The great thing about this comp is you can even enter using CC, all challenges are judged via pictures and require you to show off your amazing entries in slideshow. 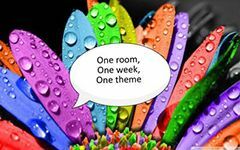 Some amazing weekly themes so jump in and have some fun. If you would like to add some news from your competition please contact me by posting on this thread or messaging me. 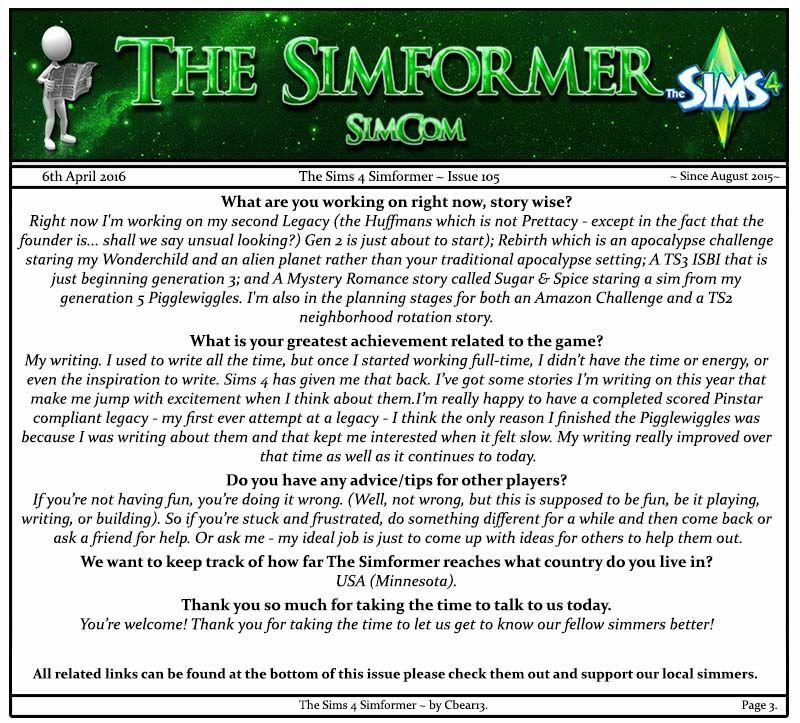 The Gazette has moved and will now join us here at SimCom with a new name The Simformer, with all your favourite simmers still being interviewed The Simformer (found here). With a new look I will continue to do interviews in my spare time to keep you entertained. For all you aspiring writer's out there please head over to the Writers' Lounge (found here) hosted by the lovely @CathyTea. It is a great thread to hang out and find some new stories to read. We hope to bring you some more amazing news and community threads to keep your eyes out for so please let me know if there is one you love and would like to see featured here. 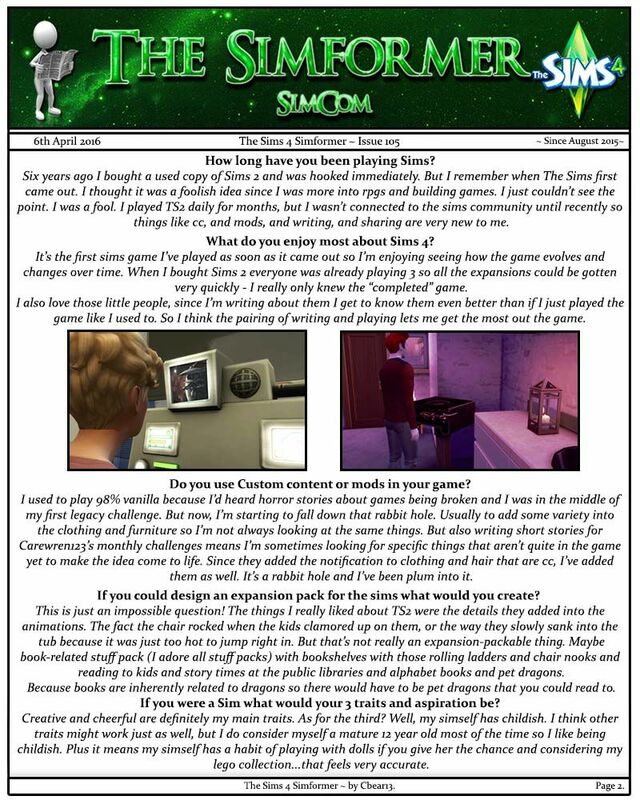 Welcome to The Simformer newspaper. Always wondered who these amazing people are we chat 2 everyday, what they are about and how they get inspired to do what they do? I know I have. 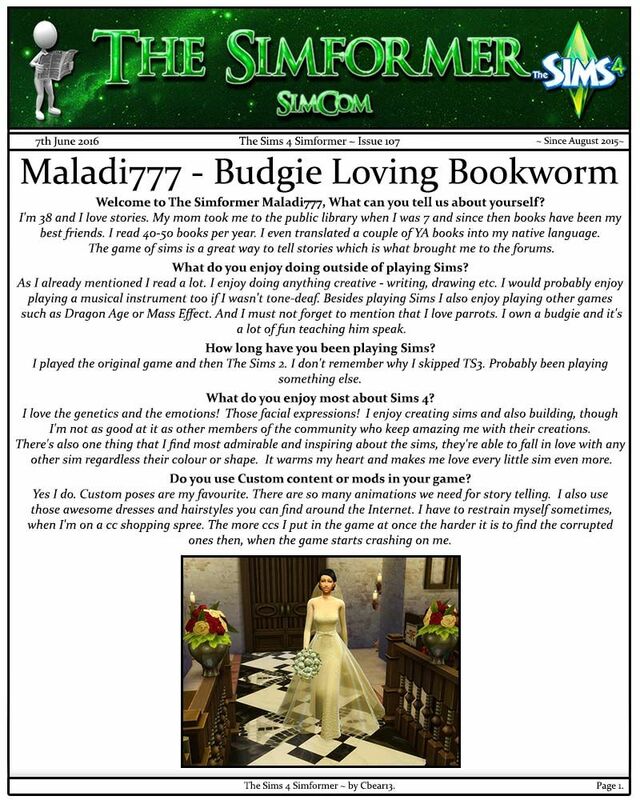 So here we are, a Sims4 newspaper for the community to learn a little more about the person behind the avatar. 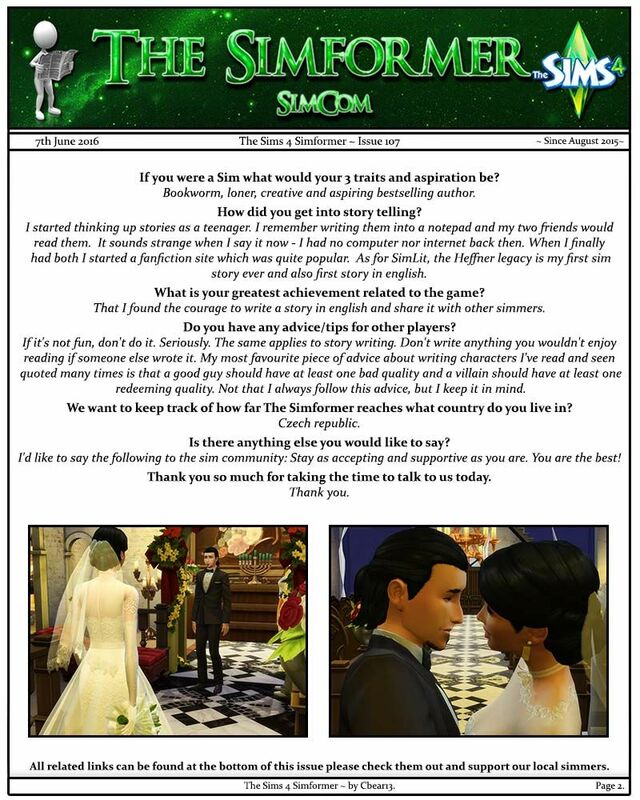 We want to be clear that all interviews are strictly sims related unless the interviewed person would like to add something to it form their own perspective. 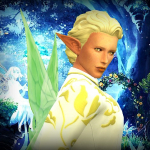 You are welcome to comment after each interview and chat to your favorite builder, sim creator or sims4 talent. Also feel free to nominate anyone you would like to learn more from and I will endeavour to interview them. South Africa: @zita1966z (Issue 4), @Issabella14 (Issue 3), @BobSkellington (Issue 12). Hi I’m Lisa and I’d like to welcome you all to Lisa’s Magical Land where beautiful lots and rooms just seem to pop right out of the ground! I will be scouring the gallery for my favourite lots and rooms and showcasing them here. I’d also like you all to get involved by nominating your favourite lots and rooms. I’d like to add I am so happy we can all come together as a community and celebrate each other’s creativity. So let’s get building! All Past Issues can be found here! 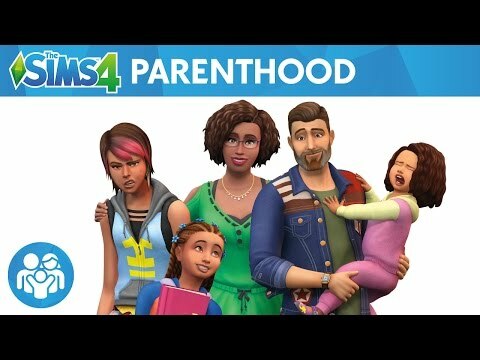 Happy Simming and Building everyone! Hi everyone! I am Suzie Sprinkles. I live in Momma's Neighborhood and I am looking to find some great sims to move into my game! 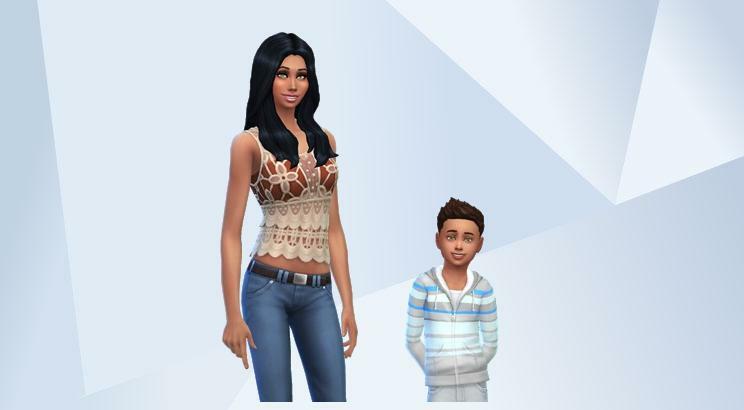 I plan to search the gallery for awesome Sim Households. 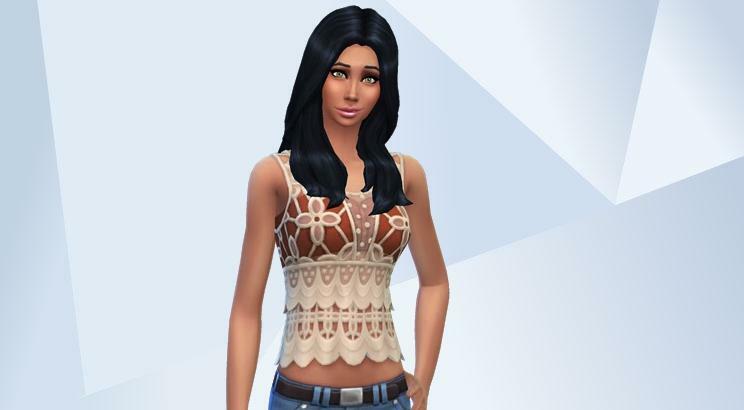 If yours gets picked, I will showcase your sim on my thread with a link for readers to download it and you may even be contacted to share your creative process for your creation! Each showcased sim will be replaced with the next showcased sim to give everyone a chance to be my neighbor! Searching the gallery today for some great single family households that stand apart from all the rest, I came across the adorable Zapata family by Origin Id @Lyntle. The description states that after her husband's death, when their son was a baby, this beautiful mom has struggled to be a single parent and after moving to a new town for a better life. Araceli can only hope that she is doing right by her son whom she loves and adores. Zane is always helping his mom around the house and hopes that this new town will change their luck. Aren't they just so sweet! My heart aches for the story line and Suzie felt compelled to help out in anyway she could. We here at SimCom wish you nothing but success and happiness Araceli and Zane! In addition to showcasing my favorite sims, I will also be hosting Won't You Be My Neighbor! 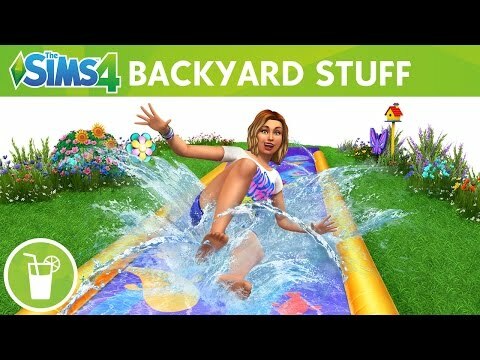 Which will be a fun little game where I will post themes and you create a sim that fits the theme and share it on the threads. It isn't a competition but who knows it might help you increase your downloads! 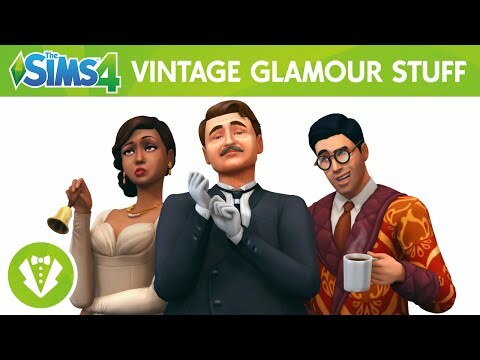 Be sure to show us ALL of the outfits available for the sim! Come on and play!!!! The New Year's Eve celebrations have our beloved Suzie Sprinkles in partying mood. 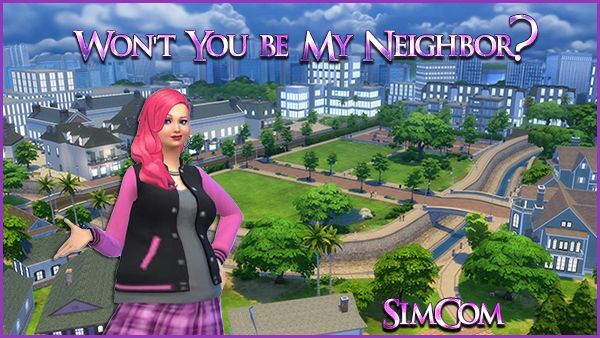 She would sure love some like-minded sims to join her in her neighborhood! Won't you be Suzie's neighbor??! Ok Everyone! Here is your chance. Let's see your New Year's Eve Ready Sims!!!!!!!!!!! Post pics with link to download. Here at Pebblycat’s Corner we are looking for new ideas on how you can style your Sims and your Sims’ homes. These Ideas will be displayed on the “Ideas Board” and the board may contain themes for builds, hot colour combinations, creative ideas from your builds (I will be searching the gallery) and inspirational pictures from real homes or people. If you have ideas that you would like featured on the board then please contact me through the mail or you can post it on the thread. For each edition of the Ideas Board I hope it inspires you to create and I would love for you to share it with us (must have an aspect from the ideas board included). Creations will have the chance to be showcased in addition to the board so please use the #SimComIdeas in the gallery or provide a link to your showcase thread. If you have a creation to share please contact me through the mail or post to the thread! Personally I find roofing the hardest and most frustrating thing about building in Sims 4 and would love to have auto roof back. I’m pretty bad at creating roofs and you’ll often hear me cursing endlessly at the computer. Luckily for us there are some talented and kind people who take the time to make tutorials and answer our questions on those pesky roofs. One of these people is @sawdust who has created a thread over in the Australian forum to help us better understand types of roofs, placement and placement methods as well as roof decorations. With @sawdust’s permission I will be featuring her tutorials here for you all to see! I’ll spread it over a few issues of Pebblycat’s corner but if you have any questions feel free to head on over to the Aussie site* (see note at the end of the post) and check out the thread. A gambrel roof is basically a gabled roof with two pitches. The lower part of the roof has a steeper pitch than the top part of the roof. They're the sort of rooves you see on barns and sometimes the Cape Cod style homes. I've used it on my Elven Inn and the barn on Uncle Henry's Farm builds. Raise the half gable section to be roughly as high as the walls on the second storey. While holding down the "shift" key, drag the arrow that is circled in the picture down to reduce the overhang. By holding shift it will only reduce one side. You will need to do this for both half gable sections. Then place a full gable roof section on top of the second storey and drag either arrow that is circled in the picture up to reduce the overhang. As we want both sides to reduce this time we don't hold down the "shift" key. You should now have something like the picture below. You can see where I have circled, the top and bottom sections don't quite meet cleanly. You will need to adjust the heights of both half gables up slightly and decrease the height of the full gable on top until all rooves meet cleanly. Sometimes you will need to hold down the "alt" key so you have more control when adjusting the heights. If you have done it right you should end up with something like the roof below. Place a hipped roof as below. Then place a gable roof over the same width but a tile or two less in length. The length of the gable will determine how much of the gable you will see. If it's too short, you won't see any, if it's too long you will only see gable and no hipped roofing. The two roof types together should look like the picture below. As the gable section has eaves (overhang) and the hipped section doesn't, we need to remove the eaves from the gable. Do this by dragging the arrow that is circled in the picture up. Then it's just a matter of adjusting the height making sure you keep the same pitch for both rooves. It's easiest to adjust the hipped roof first. This style of roof also forms the basis of an Asian hip and gable roof but we'll talk about Asian style roofing later on. A Mansard roof has a relatively steep pitch but is flat on top and is used on a style of architecture known as Second Empire. Unfortunately we don't have a draw tool for a Mansard roof like we did in Sims 3 but we can make our own. The smallest area you can cover with a mansard roof is a 3 x 3 square block so if you want to build a tower structure with a mansard roof you will need to make it at least that size. We begin by building a room on top that will serve as the flat part of the mansard roof. Draw the room between 1 to 3 squares from the outer edge of the room below. How many squares will determine pitch, less squares = steeper pitch. Then using the half hipped section we cover the lower floor around the outside of the upper floor. Once all 4 sides are in place we raise the height of each roof section until it is roughly level with the top of the upper floor. Then using the fence tool, choose the style of fencing you want and place it around all 4 edges of the upper storey. Then choose a trim to neaten the area where fence meets roof. I've used the Jutting trim in the picture but you can use whatever you want. If you use the Stepped or Dentil (the two on the end) you may need to lower each roof slightly so the full trim can be seen. In the picture I have highlighted where to find trims with an arrow. Then it's just a matter of finishing off with your choice of roof trim and roof pattern and you should have something that looks like this. Stay tuned for part three of Roof Talk! Hello, fellow sim junkies! 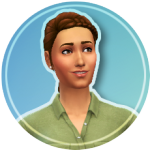 I’m Pammiechick—a person who loves to play the Sims! 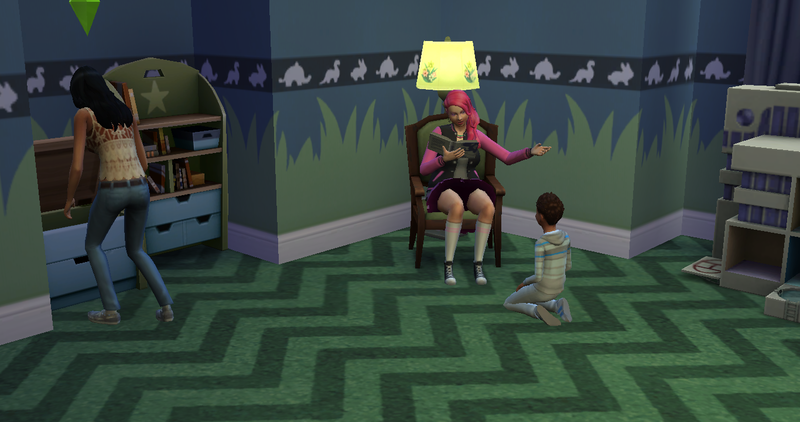 By trade, I write stories for children, but when I explore the Sims, I love to pen adult stories through different challenges! 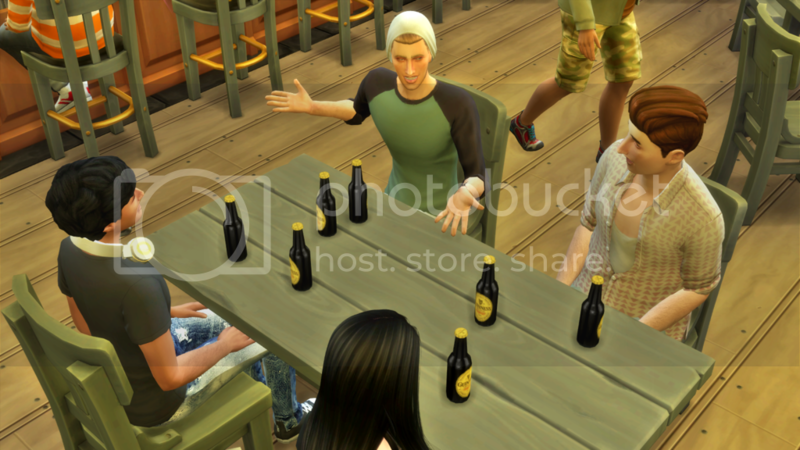 The sims seem to tell their own stories, too—it’s so much fun to see them at work! That said, this little section of SimCom will be dedicated to some of the most creative, well written stories I’ve come across. I will highlight those stories people may not have read before. It's been a while since I updated this, but the story I'm about to share with you is worth the wait! Not following a challenge, author @Jellysimwich weaves a young adult tale of a girl, Desiree Osei, who finds herself living with her estranged father whom she never knew growing up. And suddenly, she now lives next door to a guy her age who, btw, is VERY easy on the eyes. Add in another boy she meets at school who is her best friend's enemy and you have a cauldron of teenaged angst, triangle romance, and a bit of mystery that will leave you pining away for the next chapter! The characters here are written with so much depth and layers that it's hard not to love all of them. So, it's difficult on your emotions on which boy to root for in the love triangle--Elliot or Dodi? Not only that, but @Jellysimwich is a machinima artist who also throws in a video teaser from time to time. It's an amazing story that you must check out-- LIFE IS. 1. Your story is unlike most where people use a challenge as a story starter. What made you decide to do an original story? I have a really hard time following rules and guidelines. I discovered early on that dancing to the beat of my own drum suits me best, and so, writing an original story was mostly a no-brainer. For me it's rewarding to concoct my own recipe from start to finish. 2. Unlike most romances, I like both leading males. What is it about these characters do you like most? 4. Will this story have a definite ending or will it go generationally like other stories. If it will end, do you know how many chapters we can expect? I've recently become torn over this. Initially, I was going to write this as a short story with a definite ending but as I've expanded on characters' backstories (opening up subplots) I've made adjustments where there will be 'seasons' much like an ongoing TV series. I estimate each season will have about 20 chapters. As a fan, I'm VERY thankful for that! 4. In the middle of the chapters, you do a short video. Why did you decide to do this? What kind of media did you use for your video capture? 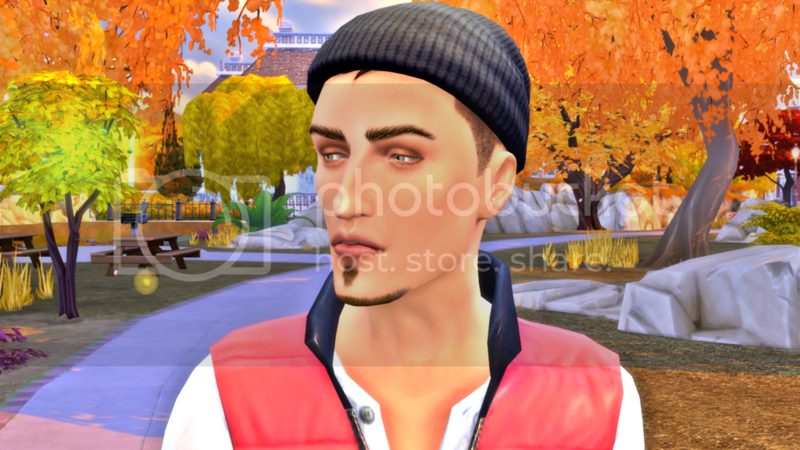 Was it hard to "force" your sims to "behave" for their scenes? I don't like being trapped in one medium when I do storytelling, so periodically, I will bounce between written format and movie format. For me it's refreshing and hopefully my readers will find it refreshing, too. To make my videos I use Sony Vegas and Power Director. As for getting my sims to do exactly what I want for animated scenes, it does take some time and patience, but I was a machinima artist long before I was a simlit writer so I'm fairly comfortable working my way around staging animations. 5. Have you written other stories? 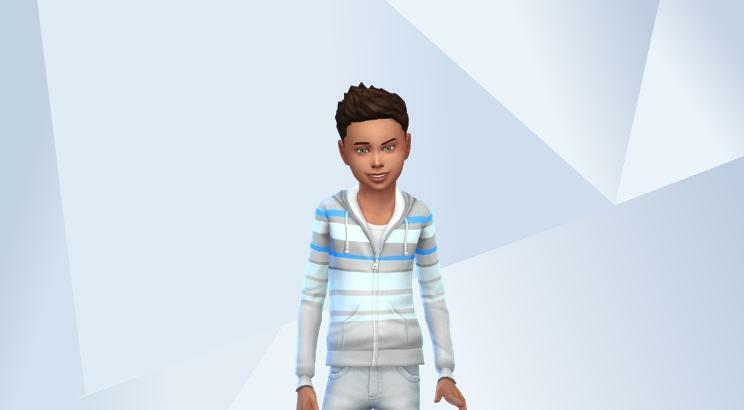 Life Is is my first simlit story but I have done a lot of storytelling, both Sims 3 and 4, on my YouTube channels. One of my most successful stories was my Walking Dead comic-style series featuring Daryl Dixon. I also had a Supernatural series underway featuring the Winchester brothers but then the Sims 4 came out and I dropped it. 6. You are a pose maker. What are some of your favorite poses you've created? How can we download these? I'm a sucker for the lovey-dovey type poses but lately I've been into making somber-esque ones. 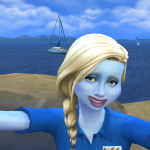 My mainstream poses can be found at Jellysimwich Sims 4 Poses. I'm working towards adding animations but I'm finding that I don't quite have the time to invest in that right now. 7. Are you doing any other creative endeavors with the sims? Sometimes I have a nasty habit of biting off more than I can chew! So for now, I am going to primarily focus on Life Is. 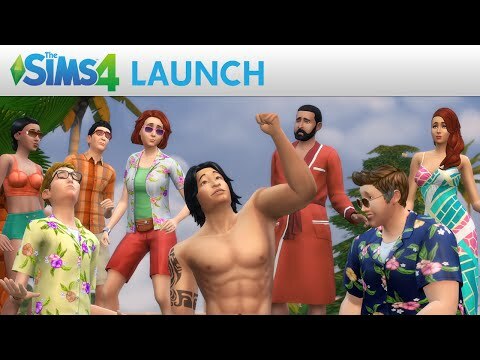 That said, I do have a new Sims 4 series I'll be releasing sometime this fall or after the New Year that will be posted on my YouTube channel. I don't want to give too much away but it'll be another original young adult fiction. If you want an interesting romance that is eloquently written and adds more than just words, please check out LIFE IS by @Jellysimwich ! Here's the youtube trailer, too! Hi and welcome to my creative studio, I absolutely love seeing what ideas people come up with and what they create and a couple of things I am really interested in the sims is photography and paintings by reference. 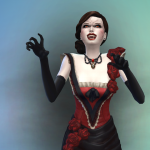 There are some amazing creations on the gallery of paintings and such that simmers have made that I will be hunting for and showcasing here. I will also be trying to create some of my own though I am no expert. I would love to see what you can create also so please feel free to post on the thread your photos of anything in sims (the more creative the better) and I will choose some to showcase. 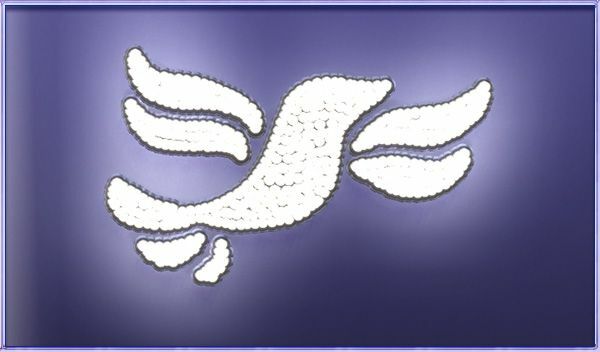 It would be great if you can put them on the gallery also and I will share the links for people to use them to. 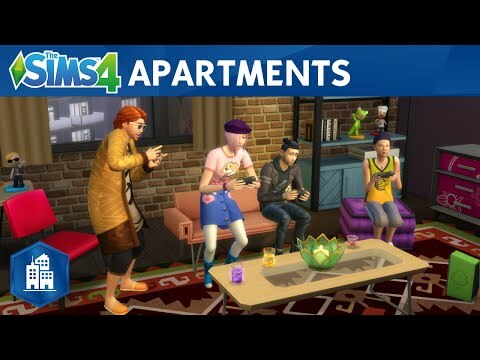 I also have seen some amazing paintings by reference, you can create your own scenes to paint or try capture sims in action. I also now and then may put up some a theme for some photos or paintings for people to try capture and post pictures of and I will showcase the most creative ones. Decorating your sims homes with photos and paintings can really give it it's own personality and style and really brings them alive. This week I have found some wonderful Alien photos though the person who uploaded them have their comments disabled which always makes me a bit wary so if they are stolen from someone else please let me know I have tried to find them on the gallery from someone else and haven't so far, they are all CC free so download them and decorate your favourite lot to play with now. Don't forget to hashtag the creator and credit in your comments if you upload anything using these. I know this piece is not photos but wall art and I think it looks amazing and so creative. They have many more creative wall art on their gallery so check it out. With our paintings this edition I wasn't looking for a particular theme but just picked out some that look completely different that caught my eye. These gorgeous landscape paintings would be the perfect addition to your house. And some of you know I have my own horses and a lover of anything magical I couldn't help but share these amazing unicorn paintings. Simply gorgeous and great colors to add to a child's room. Sunrise colors art (Download here) by KassSimsDesign otherwise known as kass2217. Please feel free to share your artwork. 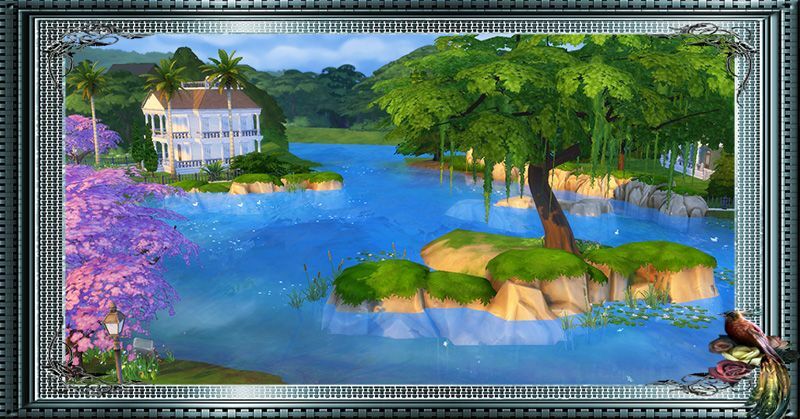 As for my screenshots of landscaping around sims, I found this gorgeous fishing spot in Newcrest and just had to share, I especially loved watching the swans swim on the water. If you have some lovely photos or paintings that you would like to share please post them on the thread and I will randomly pick ones to showcase here. Also random funny pictures that you make take of your simming we would love to see aswell. Oh wow! @Cbear13 Loving the Creative Studio! Nice. It was my pleasure @Pebblycat it's so cute! Great first Issues @Cbear13 and @Pebblycat I need to try the skylights for sure @BryonyRae 's build looks so amazing! Purple is my favorite color tho! Thanks for the mention @Pebblycat! Seems like this will be an interesting thread with quite a variety topics. I look forward to seeing how it evolves. Awesome @mommataurus2 ! Looks fun! And I love Suzie Sprinkles!!! Yes! I definitely will download and play it! Love the new clubs! Hi everyone, welcome to SimCom. Please excuse me for the shout out I will only be doing one and sorry if I have missed peoples names as there is so many of you. Thank you and I hope you guys enjoy the thread.